I'm not typically a big poetry person. I won't lie, it can tend to make me feel a little stupid-- like I missed the boat somewhere. Or, at least missed the English classes on how to understand ambiguous phrasings of words meant to lead to higher understandings of life. After all, I was an English major and have a master's degree in a writing related field, aren't I supposed to just get these sorts of things? Frankly, the truth likely lies in the fact that I'm not a very patient person either. I want my dose of information straight up-- let's not beat around the bush. As you've likely picked up from my blogging, I'm a pretty honest cat. No fuss, just the honest guts. It gets me in trouble sometimes, but it's who I am. So anyway, I was quite pleasantly surprised when I really found myself enjoying a collection of poetry recently. 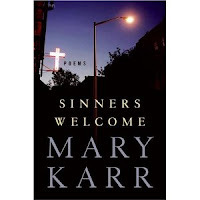 The collection is called Sinners Welcome by writer Mary Karr. I borrowed this book as well as her recent memoir Lit from the library prior to the Festival of Faith and Writing. I hadn't read anything by Karr and wanted to see what she was all about before hearing her speak at the festival. Karr had an incredibly difficult and crazy childhood; all the horrible things you might imagine that would make a childhood hard, plus some. Her first memoir, Liar's Club, recounts many of these stories. I started to read it, but as the sensitive mother of two small children found it too difficult. Lit is about her later years, college and early parenthood-- I find it easier to read about adults inflicting bad decisions on themselves rather than adults hurting children, and have enjoyed the memoir so far. Her collection of poetry seems to capture many of the raw emotions from her life experiences in short soundbites. They do not come across as archaic and ambiguous to me, just real, and deep and well put. The way I like poetry. Here is my new favorite poem by Karr. It has appeared in the New Yorker among other well known publications. It seems to capture the grit and grace of parenthood, the beauty and the chaos, the fact that we cannot control our children's every move, just try our best to guide them in the ways they should go and hopefully, someone will someday say, "Nice kid." Phone lines snapped and hissed like cobras. on the pages of Emerson's "Self Reliance"
willing to do stuff she'll regret. and Dad screw up so much? idiot now. At which he grinned. Nice kid, said the cop. Please bear with me for a moment as I offer you this somewhat cliched analogy. First, let me say, having children quickly relegates free time to new heights as a precious, PRECIOUS commodity. Here is the analogy-- it has become such a precious commodity that I often feel like a woman walking through a very hot desert, parched and tired and searching for water...when I finally arrive at the free time (or the water!) I guzzle, gulp, slug it down and try to relish it for as long as I can because the next drink might be a very long ways away. Life is really not quite that bad, but free time most certainly does feel that way. Free time typically comes in the following forms; early morning rising on my part, nap time (between 2-4 most days) and after the girls go to bed, which lately has been around 9 (late, I know! but that's a whole other story). When it doesn't come as expected or it is shorter than expected I become a little cranky and very disappointed. Like yesterday afternoon and then again this morning. Ella has been on a bit of a sleep strike. Yesterday she napped for about an hour instead of her usual two (she and Ava usually nap at the same time) and this morning she was up at 6:30 instead of 7:15. First of all, I do realize how lucky I am that they a) both nap at the same time and b) that Ella usually sleeps past 7. But, despite my being lucky about those things, when you get used to a given schedule you begin to set expectations according to that very schedule. I know. Big Mistake. Rule #2 for mothers of small children (which comes after Rule #1 Always, ALWAYS, expect a mess) is Never, EVER set expectations. Not setting expectations is SO much easier said than done. I mean I'm human. I have desires. Sometimes they're selfish, but sometimes they're just me wanting to still be ME and not just mommy all the time. Things like reading, writing, and pursuing the eons of ideas floating around in my mind on a daily basis. So yesterday Ella woke up just as I started to drink my coffee and type this blog, and this morning she woke up just as I was about to get up, make some coffee and spend some time praying, thinking and planning my day. It's hard when your head is full of ideas. You start to feel like you're finally beginning to jive with your role as writer/reader/creative person AND mother and then your 1 year old decides that your new ideas about when you're going to explore your ideas is not really going to jive with HER schedule...and again her needs take precedence. Perhaps it's the angels of patience and peacefulness testing me. After all, I have been feeling awfully peaceful and grateful and thankful this week. For life, for the girls, for the sun, for the wonderful conference I attended last week, for my husband, our home, all the big things. "Will you still be grateful and cheery if we throw this little monkey wrench into your afternoon and morning?" they want to know. It's just a little thing. The quiet time. But it's a big thing to mommies. Argh. I'm smiling back at those angels with gritted teeth. "I'll smile, but I'm not happy about it," I say to them. My coping mechanism yesterday was to go for a run as soon as my husband was done with work. Actually, if I'm totally honest, he was finishing some work up from his home office in the basement when I opened the door and yelled down the stairs at 5:45 that I was going out of my mind and that he didn't have to be done but that I just wanted to know when I could expect a helping hand so that I could roughly plan out the rest of my evening...including the run I desperately needed before bible study at 7. It wasn't my most shining moment. It's what happens when my free time is foiled. I get a little cranky. He came upstairs shortly thereafter and I left the house running. Literally. It wasn't my best run. I was tired. It was windy. I was letting the frustration eek out of my shoes... every time I wanted to stop I pushed harder because for the first time all day I was in control of something I was doing. When I first started to write this post yesterday I found myself wanting to find some nice clean way to wrap it up. Some epiphanal moment in which the sun started to shine over my little world and the angelic chorus sang as I came into some new understanding of myself or reacted in a completely selfless way towards my family. But, that's not really what happened. I recall the therapist I was seeing before we left Massachusetts saying to me, "You may always struggle a bit with motherhood; with your role as a mother and your desires to do and be so many other things." I think she was right. It may be unrealistic to think I'm going to reach some euphoric acceptance of motherhood in which I'm SO completely enamored with being a mother that I don't care about anything else; writing, reading, learning, pursuing freelance opportunities, running, thinking, journaling, blogging-- all of the other things that make me me. There are days when the two me's jive and others where they simply fight each other...like siblings...who love each other deeply but who just cannot seem to get along on some days because they are into each other's stuff. In as much as I'd love the girls to just get along for the next 18 years while they live under the same roof together, it's not such a realistic notion. In the same way I'm learning to accept that these parts of myself may just need to agree to disagree on some days...sometimes it's not about the day to day, the day to day can get ugly. Sometimes it's about the bigger picture. 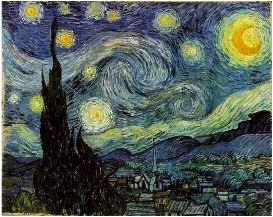 When you look at the smaller details of a painting (like the one to the left) some of the strokes are dark, jagged, unclear, messy, but if you step back and look at the whole thing you begin to realize that it is the entirety of all of the colors, all of the strokes, all of the pieces that make it beautiful. Here's to jagged edges and beautiful pictures. 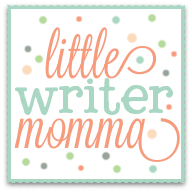 For those of you who visit often you'll notice the change to my blog background! Blogger added a handful of new templates and a new design program that allows you to play around with them. The inner artist in me couldn't resist. I've been playing around with different templates on and off for a couple of weeks, but thought that this background was bright and cheery, which makes me happy, so hopefully it makes my readers happy too! I'll be working on my header next. I don't feel very full of words this morning, but have a bunch of pictures from my outing with the girls yesterday. We went to a fun little play spot called Explore & More in East Aurora, N.Y. and had a blast! My friend Melinda (one of my bestest high-school friends!) was planning to go, and her friend Megan was planning to meet her. So there we were, 3 mommas, 6 children, and 1 grand-momma (Melinda's mom- whose extras hands we were quite glad to have!) and we all just played for a good two hours! It was one of those mornings that I was truly content to be a SAHM (stay at home mom). Really. I had this thought, even as we were walking out the door in the morning, that I wouldn't have things any other way. I can't imagine not being able to share these experiences with my girls while they are young and I wouldn't trade anything for it, not even the best writing job at say the New York Times or Vanity Fair or even Better Homes and Gardens (or one of those other girlie magazines!). Two years ago I'm not sure I would have said that. I was really struggling with wanting to continue my career in a more concrete way...today I am content. Content to be able to pursue writing projects from home and happy to give my girls shared experiences with me while they still want to share experiences with me! Being a SAHM (stay at home mom) is a sacrifice. I am sacrificing furthering my writing career at a faster pace. I am sacrificing the experience of potential full-time writing jobs with great organizations and publications. But it is worth it. I can't imagine not giving this time to my girls-- there is SO much happiness and contentment and relationship building that I am offering them that quite simply they would not have if I were working full-time. I know that it is not possible for everyone. I have friends who have to work full-time because their job is the job that pays the bills and offers the insurance. I empathize with them because I think, mostly, they would truly like to have more time at home. That said, if you are in a job, just to work, not because you need the money, or the insurance, but because you are afraid to lose your professional self to the daily and sometimes tedious tasks of taking care of children, I would challenge you to re-think what you are giving up. It took me three years of being at home to figure it out, but I'm grateful I did. I know many moms who have made similar sacrifices and are grateful. My friend Melinda, who I met yesterday morning, has passed up management promotions so that she could be more part-time. My friend Maria who is starting a very cool children's book publishing company here in Buffalo has sacrificed fast-tracking the growth of her company so that she can be home when her daughter, who is now a junior in high-school, comes home (along with her other children). Her daughter came home one day several weeks ago completely distraught over an attempted suicide by a classmate. Maria wouldn't have traded the ability to be there for her daughter for any amount of professional growth. So anyways, just something to think about if you are on the fence about a decision that will allow you more or less time with your children. Here are a few of our photos from yesterday! Have you ever experienced something so profound, so outside your box, so humbling that you're not sure you can put words to it? I know, I'm the writer...where are the words? Let me give you a little backstory. Several months ago, Scott sold a 401K plan to a medical practice in Buffalo's inner city. I mean INNER city. A recent stat I read from the census bureau ranked Buffalo as the 2nd poorest city per capita in the country! This particular medical practice resides in a zip code that is the 3rd poorest of all of Buffalo's 17 zip codes. When Scott came home to tell me about this medical practice and the ministry (Jericho Road Ministries) that had branched off of it, my heart was moved to find out more. It was also inspired. In that moment I decided that I wanted to begin writing profiles of non-profits in the Buffalo area. I felt like there were probably many non-profit organizations in the area doing amazing work for the city that residents didn't know about, or hadn't heard about. I felt that if you could spread the word, particularly to people in the outlying suburbs that perhaps it would inspire others to donate, or volunteer or connect to these organizations in some way and therefore help to promote and meet some of their needs. I thought that the Buffalo News would be a great place for these profiles, but they didn't show much interest when I mentioned the idea. A couple of weeks later I was introduced to one of the founders of an online publication called Buffalo Rising and he said he'd be more than happy to publish the articles. I set out to start my first profile on Jericho Road Family Practice and the ministries connected to them. Check them out online here. They are a ministry that primarily serves refugees who have been resettled in Buffalo, N.Y. The word "serves" seems too small, too simple to describe what they are doing. Their outreach is striving to do so much, for so many, in rather challenging circumstances, that it is mind blowing. Let me just tell you, I drove down to one of the poorest sections of this poor city and met some of it's hardest pressed residents this morning and I have nothing to say except that I am truly humbled. By how much I have, by all the blessings in my life, by the fact that we live in a country that doesn't oppress us like the Burmese women I met this morning. Some of these men and women were forced out of their homes because their governments burned down their villages merely to force these people to continue to live in fear. Some of them ended up in refugee camps for 2 years, 5 years, 10 years, 20 years! Being pregnant, trying to find food for themselves and their children, trying to take care of health concerns, from tents they had set up. Eventually, when all options for remaining in their own countries are diminished, the UN tells them they are going to be resettled into a more developed country. They have no choice where they are going to end up. Some of them end up in Buffalo, N.Y.
Two of the women I met this morning, both pregnant, have been living in the U.S. since last summer. This past winter was the first time they had ever seen snow. One of them spoke VERY little English, the other is now working as a translator. The one who spoke very little English admitted this morning to being suicidal several months ago; so depressed and so afraid of all that she was bringing her baby into that she felt like it would be better for her and her baby to not exist in the world. She had no job, she didn't speak English, she didn't know how to make her way in this place she was forced to go after experiencing awful traumas in her own country. She felt hopeless until she found HOPE, literally. HOPE Refugee Services and Jericho Road Ministries merged last year to help people exactly like her. They have brought hope into the lives of so many resettled refugees in Buffalo that people living in refugee camps halfway around the world have heard about them. What I experienced this morning was SO far outside my box that I momentarily thought I was in another country, very far from the place I live. I walked into Jericho's Walk in Center where more than 2 dozen people, speaking probably as many different languages, were all waiting to be helped. Women with babies slung on their backs, children in tow, men waiting to be driven to a doctors appointments or figure out how to get a green card. I will write more as I learn more, but needed to share this with you today. We are a VERY, VERY BLESSED people. We have so much and our difficulties are so little in comparison to the lives of other people in this world. Jericho Road is always looking for donations; adult clothing, baby clothing, they especially need car seats and cribs. They take toys and books for babies. They need diapers. LOTS of diapers! Diapers are expensive and many of these people are trying to figure out how to put food on their tables and don't even own a washer to be able to wash soiled clothing, much less cloth diapers. They are also looking for mentors for their Pricilla Project; A very cool project that supports pregnant women like the one I met this morning. Her mentee, a young girl in her early 20's, doesn't speak her language, but she takes her grocery shopping, she drove her to and attended her babies ultrasound and she helps her with her ESL work. No words are needed, just a caring heart. As I mentioned, I'll write more as I learn more, but at the very least if you have things you can donate either check out their web site or contact me and I'll let you know how to get in touch with them. Blessings to you all on this day. Count your blessings, they are abundant. Scott and I have an ongoing joke about what he does during the day; he goes to the country club, hangs out with the guys, and has his every need met. The conversation started sometime after Ava was born and he came home to tell me about his hard day and I just raised my eyebrows...you know the raising of the eyebrows that says, "Don't even get me started and please stop while you're ahead?!" So now, anytime I give him "the look" he gives me the "oh, right, I was at the country club all day." Please know that I'm writing this post from a place of relative lightheartedness. I do appreciate all that Scott does. He is a very hard worker, a very responsible husband and father and is super hands on with our girls. He is the best husband in my world, and if there were contests for best husbands he would be sure to win awards- I'm sure a lot of you ladies can say the same about your own. All that said, I KNOW many of you have thought this before while your husbands get ready for work in the morning, especially if you are a stay at home momma like me. You've thought, "I would love to be taking a shower all by myself right now, putting on nice clean work clothes and going to a place where I can do a task in peace, eat my meals without having children hanging from my ankles, and formulate several logical and intelligent thoughts in a row without interruption." Or, on the days when hubby just freely drives to his doctor or dentist appointment; "Hmmm, how nice to be able to just hop in the car and go to an appointment without having to arrange childcare or take a child with you who will sit up on the examining table asking four hundred questions while they rip the paper and beg for lollipops, which you've brought to keep them quiet, but are now feeling guilty about because you're thinking the doctor is judging your parental tactics and the amount of sugar your child is eating." "Hmmm, stopped to get a haircut, huh...must be nice to get your haircut." "Mmmm. We're going to go there again huh?" "I have to say it." See, because the fact of the matter is, even in order to get a haircut there is this whole matter of figuring out when someone can watch the children, and for how long, and arrangements must be made, and lunch figured out and then you end up showing up at your hair appointment with bushy eyebrows and greasy hair and crooked bangs you cut yourself, and no make-up on because you rushed out of the house, and your hairdresser looks at you like, "I'm good, but not sure I can perform miracles here!" Which is pretty close to what happened to me last week. And then I got a bad haircut to top it off. "Really? You're going to tell me you'd rather stay here right now, right? That it would be easier?"Grin. Grin. Grin. Ah. The poor guy. I mean what defense does he really have at that point. I know this bantering we've begun really accomplishes nothing. It actually makes me feel a little childish. Like I'm in fifth grade and back on the playground and arguing with some freckled face boy about how he has cooties and how much better girls are than boys! I also know that a more mature version of myself would work on the snarky comments and replace them with praise and thankfulness for all that my hubby provides; the house, the food, the cars, the clothes, the health insurance...the list goes on and on. "A wife of noble character, who can find. Her husband has full confidence in her, and lacks nothing of value." I know Scott would say this is true of his life, and he is so sweet for saying such things, but if I could really read his inner thoughts I'm sure there would be a wish in there that I'd stop comparing our roles and instead appreciate each other for all that we BOTH do. At the end of the day we both have sometimes hard and very important jobs, but it is why we got married-- it is why God brought us together-- so that neither of us would have to do it all on our own. This entry is as much a forum for me to joke about the kinda ugly and snarky, but also a place to proclaim my gratefulness for the wonderful man that God brought into my life to share in this sometimes hard job called parenthood, and how because of God and my hubby, the job is actually so much easier than it would be on my own. While I'm sure I will have other days where my envy overshadows my gratefulness, I hope to continue to become a woman who my husband does have full confidence in, and that I can provide a home where he feels valued and not undermined. Because I'm not 10 and on the playground anymore, and have hopefully matured to a place where it's not about who is better, but how we can both better each others lives. Or, maybe after some of my other, more "overwhelmed" entries in the last couple of weeks, you're thankful that that slump is over, let's get on to the happy, cheery stuff. Or, maybe you were thinking she needs a dose of humble pie. Or, maybe, and this is the one I hope for all of you mommas, you were thinking, that's Damned right. You are and I am too. Really, if you're a mom, stop reading this right now and just say to yourself, I AM A GOOD MOTHER. I know it made me feel better when I forced myself to say it this morning! It all started with a conversation I had with Scott last night. After I told him the 5 things I appreciated about him (see my last entry), he first asked me why I was being so nice (ha! ), and then decided he wanted to tell me five things he appreciated about me. "I appreciate what a responsible mother you are." "Well, what does that mean?" I asked. "Well, you don't go out and get drunk or smoke cigarettes or get tattos." I'm laughing as I write that because it is what he really said. I mean aren't those things a GIVEN?! He did go on to expand about my thoughtfulness about their constant needs, and feeding them, and making sure their clothes fit, etc. And, I thought, "Hmm, he's right. I am constantly thinking about their needs. I do try to take good care of them. I play with them and read them books. I've made sacrifices in my own personal life so that they can have a wonderful start to their life." We do take these things for granted--all that we do for our children. It all becomes so routine that it doesn't seem out of the ordinary-- it just seems like part of life. But it is these routine, daily things that make their lives what they are and that make them feel loved. Because our children are not old enough to understand or say that they appreciate these things, I'm here today to tell you that they do and that you ARE a good mother for all that you do. We need to say that more often to ourselves. I know I spend a lot of my days, especially when I'm feeling overwhelmed, thinking about all of the ways I am failing as a mother and wife. 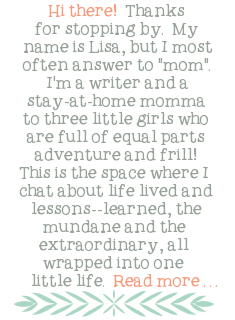 But I NEVER sit down and think about the ways I'm excelling as a mother and a wife-- and there are just as many! Philippians 1:6 says, "He who began a good work in you will be faithful to complete it." I was struck this week with how that verse applies to motherhood. God, who literally began this work within us (the physical growth of our children within us), will continue teaching us how to be good mothers to them. 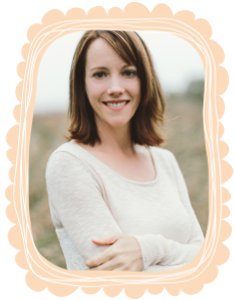 I find myself, so often, thinking of the 40 or 50 something year old mom, whose entire house is in order, who has her organizational systems down, who seems to have a great balance, as my model for motherhood. But, the truth is, that women is a wonderful mother, but she is in a completely different season than I am! I may be that mother too in 10 or 15 years. It's as if when I was working as an entry level editorial assistant at a publishing company having wished I was CEO! It doesn't happen that way. Motherhood is a new role, a new job and it takes YEARS to reach that level, that season! 1. Celebrating what I have done right and where I am now. 2. Being hopeful for the woman and mother and wife that I will continue to become as God is faithful to complete his work in me. Have a blessed weekend and a Happy Easter. I'm putting my computer away for as much of the rest of the weekend as I can! Can I just tell you, nothing makes me happier than to see Ava loving her little sister just because she wants to love her. Not because I told her to be nice, or to say hello to her, or to read her a book. Typically, if I tell her to do it, it doesn’t last very long and is not very authentic. But, this morning, I was giving Ella her bottle and Ava came over and started kissing her head, and kissing her feet, and giving her a small stuffed bunny, over and over again. Then she asked me to put Ella on her lap and started giving her sips of juice from her own cup...This, my friends, is like motherhood utopia-- I wish it were like this ALL the time. I don’t know that I can take any real credit, because I lot of this depends on Ava’s moods (isn’t that the way with us women! ), but I do hold it as one of our houses highest commandments-- you ALWAYS need to love your sister, because she is a very important part of your life. I try to implement this daily. If Ava pushes Ella I often put her in time-out and when time-out is over I make her apologize to Ella and then give her a nice kiss on her head. I try to enforce Ava saying good morning to Ella when they wake up, because Ava is often crabby about it and doesn’t want too- but I feel like it’s important. Just like it’s important for mommy to say good morning and I love you to daddy whether I’m in the mood to or not. You have to be intentional about these things, or else the time just slides by. That brings me to a point I mentioned I would talk about this week-- intentionality. I'm not sure if that is even a real world, but, even if I made it up, it is a concept that I'm am attempting to integrate into my life. It's about being proactive about your life and your day instead of reactive. We all know what reactive looks like. When we sleep in and allow the children to wake us up, and then rush to start tending to their needs, and give into our every emotion, happy or crabby, bitter or sweet. It's a roller coaster is what it is. Sometimes high, sometimes low and as much as I like the excitement of a good amusement park ride, I don't so much like my life to feel that way. 1. In my relationship towards my husband. If we don't set a date to spend time together, we don't do it. If we don't determine a plan of how a given Saturday is going to go, and who is going to watch the kids when so that we can each accomplish some of our own things, the day turns to chaos and we both get frustrated. Sometimes it comes down to asking myself on a given day, "What could I do today that would bless Scott?" It might be keeping my frustrations about childcare to myself when he walks in the door, or leaving a sweet note for him on a post-it on the counter, or sometimes just deliberately sending him a quick email (he always checks his blackberry) about how grateful I am for him. 2. My day. I'm realizing if I don't get up before the girls I tend to be reactive for most of the day instead of proactive. I've been trying to get up at least 1/2 an hour before them. I spend time praying, reading my bible and then in the spirit of the quietness I write down what needs to be done that day, a brief and flexible schedule for when it will get done, and try to include some things I think would be fun for the girls...for example, I write down "play play dough with Ava", or "take the girls for a walk"...there is a lot of spontanaeity in our day as well, but sometimes I can get consumed with what I want to accomplish around the house or for myself and feel as if I'm neglecting what they'd like to do. There are many more things in my life that I'm trying to be intentional and disciplined about; exercise, eating habits, sometimes even things like turning my computer off and forcing myself to not open it for several hours. At the end of the day, while we can all often cringe to think about doing things we don't want to do, life flows better when we are intentional about doing what we need to do...that way, it almost makes you feel like you wanted to do it all along...you know, like cleaning out your fridge...mine is a disgusting mess, but it's on my to do list for the day and I'm going to be intentional about getting to it! Hope that made some sense to someone else but me! At the very least, force yourself to tell your husband 5 wonderful things he does for you when he gets home from work today-- it will change the mood of the entire evening!